Need dessert for your next potluck? Our Lime, Coconut and Pistachio Cheesecake is just the kind of recipe you've been searching for. A creamy cheesecake with a sweet and tangy taste. And as a bonus, it makes 20 servings. Problem solved! Line 13x9-inch pan with foil, with ends of foil extending over sides. Combine baking crumbs, nuts and butter; press onto bottom of prepared pan. Refrigerate until ready to use. Beat cream cheese and sugar in large bowl with mixer until blended. Add coconut, lime zest and juice; mix well. Add eggs, 1 at a time, mixing on low speed after each just until blended. Pour over crust. Use foil handles to lift cheesecake from pan before cutting into pieces to serve. 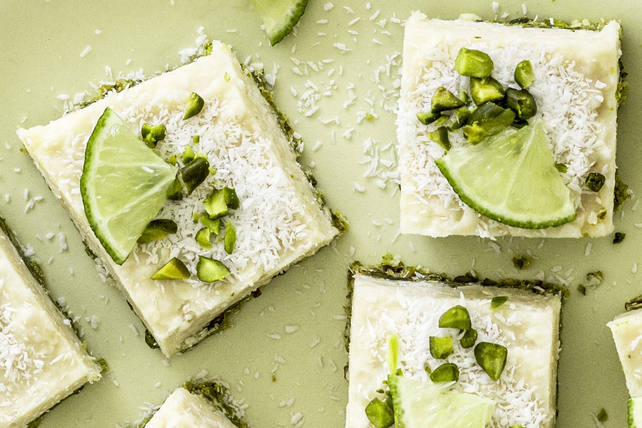 Garnish your Lime, Coconut and Pistachio Cheesecake with lime slices, chopped pistachios and additional desiccated unsweetened coconut before serving.